Did you grow up having Coke and fries as one of your best childhood memories? ❤ I was certainly one of those kids who got excited for a happy meal with fizzy drinks. But, when I grow up, diet is becoming more important, so I only have Coke occasionally during my cheat days. I am thrilled as it is totally guilt-free! It’s the first time Coca-Cola does such an exclusive, limited-edition makeup collaboration and they have THE FACE SHOP on board for this! Comprising 6 skin-friendly items with ultra-wearable happy shades, this makeup collection wows me when I first see it. Featuring Coca-Cola’s signature colour, Coke Red, the eye-catching packaging brings the ol' vintage charm to live! Complete with retro-inspired pop art drawings, swirly straws and polar bear details, how can I not fall in love with them? The best part is, all the lip products are Coca-Cola scented! For the base makeup, I have previously shared about my experience with the complete range of THE FACE SHOP Miracle Finish Cushion which includes the oil control water cushion. There you can find out more about the formula, texture, feel etc. 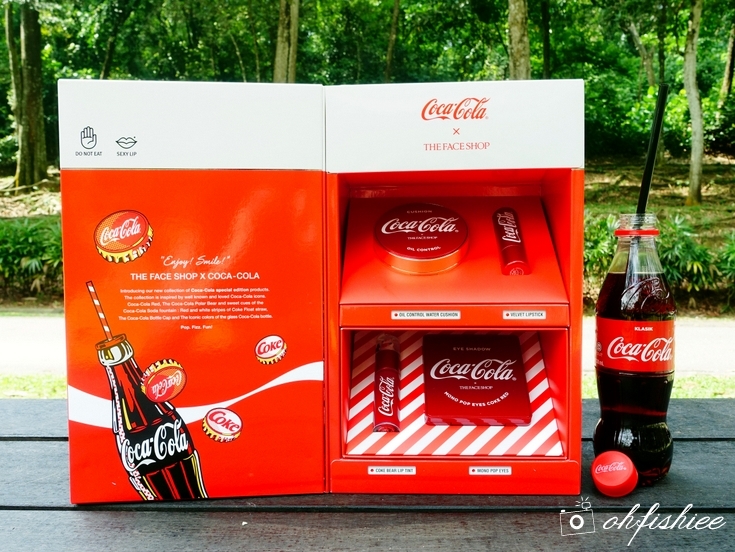 Nevertheless, this packaging is definitely more appealing especially for Coke collectors! 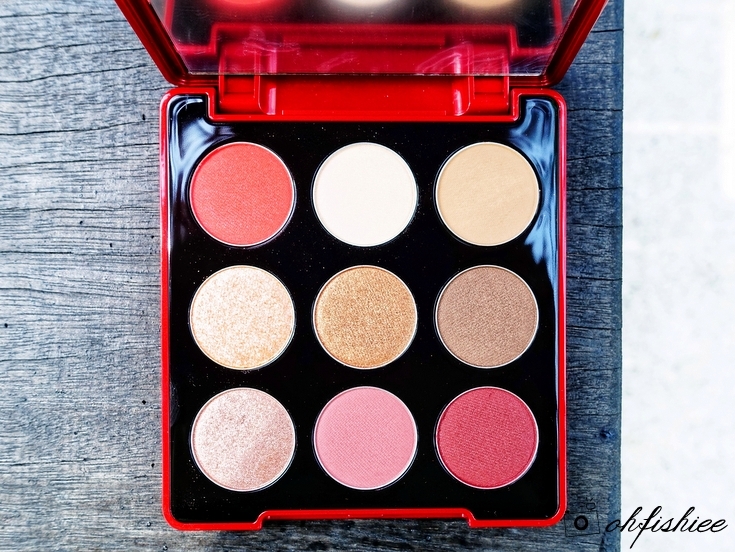 Among all 6 items, the most exciting one is probably the signature Coke Red Eyeshadow! The topmost left shade, Coke Red, is the trendiest shade for eye makeup right now while the remaining 8 shades are equally versatile as all of them are inspired by the sparkling freshness of Coca-Cola. Use Coke Red shade along the crease of your upper lashline for a warm pop of color. For other colors, have fun playing with them! in matte, shimmery and glittery textures. Very easy to blend. Feel: Smooth and velvety on the eyelids and undereye area. 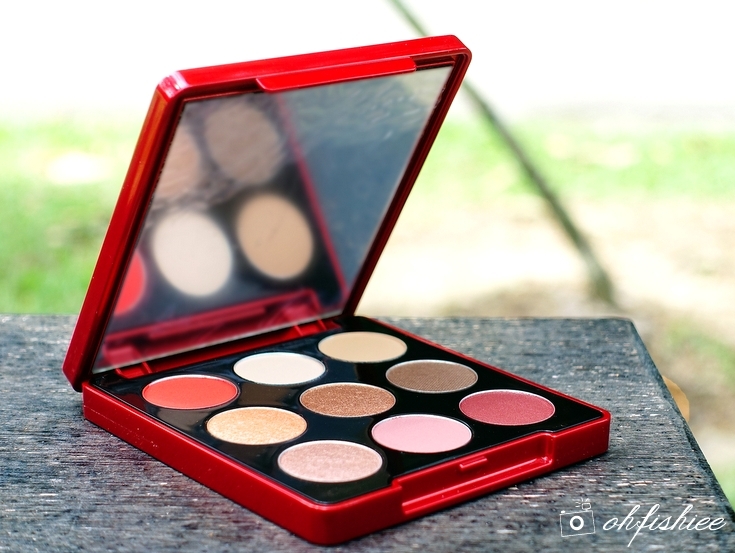 What I Like: It is easy to mix and match the 9-in-1 eyeshadow palette for creating subtle or dramatic eye makeup look. Plus, the glitters have high adherence on the eyes and hence the eye makeup can last for long hours! 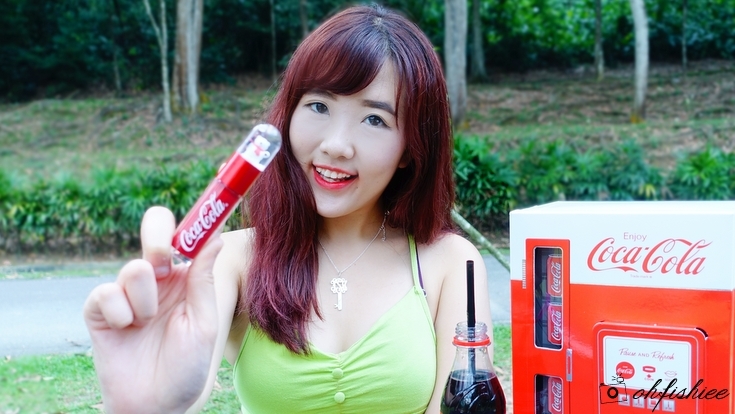 Sweet and kissable Coca-Cola scented lippie! Yay, all the lip products under this series have strong, pleasant Coca-Cola scent! Although this matte-velvet lipstick smells like real Coke, it doesn't taste anything on the lips. But I think it is the stunning packaging that makes me fall in love with it -- I mean, look at the red-and-white swirl pattern on the tube, how retro it is! Trace the lip line with the pointed end of the lipstick. Then use the flat, angled surface to shade and fill in lips. Texture: Although matte, it is more moisturising than usual, all thanks to the Red Fruit Complex. Color Payoff: Extremely vibrant and bold. Love it! Feel: Easy to glide onto lips and smooth away any visible lip lines. What I Like: It gives the pout a bold statement, with sufficient moisture and creaseless coverage. But sometimes when I want to tone down my lip makeup, I'd use this cute lip tint for a subtle, dewy hint of translucent pinkness instead. It is not only scented with Coca-Cola, but also protects the lips with long-lasting moisture care and healthy lips look. For gradient effect: Apply tint onto the inner part of the lips only. For full, striking effect: Fill in the lips completely. Texture: Ultra lightweight, soufflé-like texture. Feel: Wet and natural finish on the lips. What I Like: Versatile! The tint gives a healthy pout look in just one single stroke and is easily buildable (apply few layers) for bolder lips. 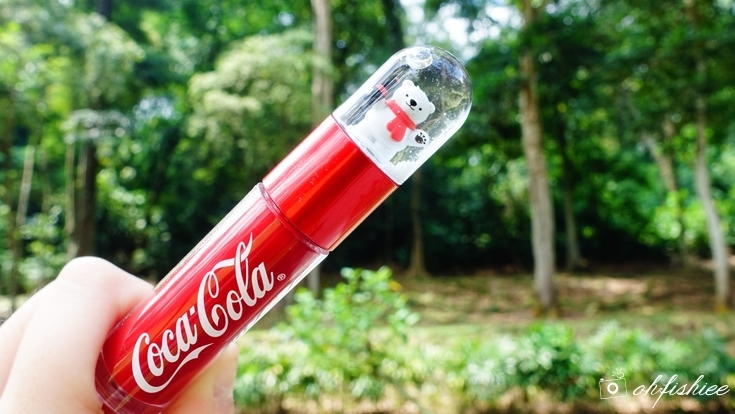 THE FACE SHOP x Coca-Cola series is probably the coolest makeup collaboration I've seen. Apart from my favourite Coke Red themed eyeshadow, the Coca-Cola scented lip products are equally amazing in terms of quirkiness, packaging and finish on the lips. Must-buy item? 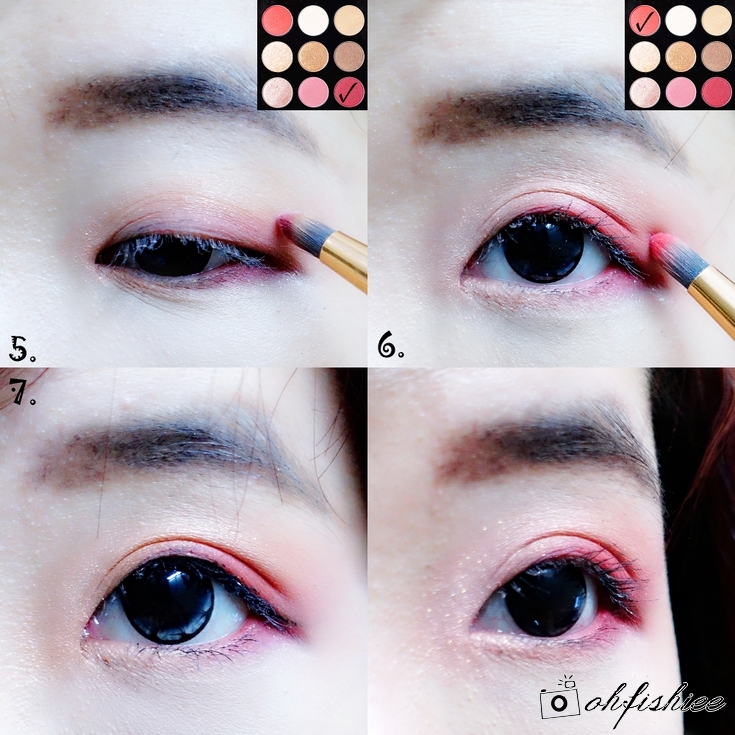 Coke Red Eyeshadow! THE FACE SHOP X Coca-Cola will be available at all THE FACE SHOP outlets and online store (www.thefaceshop.com.my) from June 2018 onwards.